Finland is a member state of the European Union and as such is party to the cross border regulations dealing with divorce. No grounds are required for a divorce in Finland. The divorce can be granted immediately if the couple have lived apart for two years but if not, the divorce should proceed in stages. As a rule issues relating to children are dealt with in the course of the divorce proceedings. Any dispute is handled as a separate issue because the divorce itself is not really capable of being contested. Arrangements concerning children are determined solely by the child’s best interests. The property division takes place after the divorce has been effected and is a separate issue. Frequently there is a marriage contract or a prenuptial contract, and that will be followed. Otherwise the property of both parties is taken to be matrimonial property and is divided equally. There are elements of flexibility in certain circumstances. The law is close to Swedish law in that it is rare for maintenance for the spouse to be ordered. Even where it is, amounts are small and the term is generally very limited. There are substantial difficulties in obtaining full disclosure. The Court has limited power to impose sanctions and accordingly in such cases there is a definite disadvantage to the other spouse. 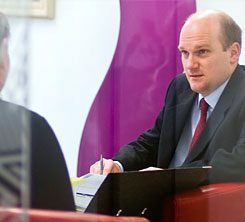 We are a specialist international divorce firm and family solicitors who advise numerous clients who are either UK-based but originate from Finland, or are living outside of the UK but have a connection with England or Wales.